I've been piling on the pounds recently, so I dug out all my old wholefood cookbooks in an attempt to get healthy. I have an extensive collection of cookery books from the 1960's and 70's. I found them all in charity shops and bought them all for the illustration. I just love those drawings. I believe that this illo was heavily influenced by that whole vibe. This one started life as a 'simple line drawing', as many of my drawings do. Five days later I'm still undecided about it, but after all that time it's being posted. Undecided or not. I'm decided--it's great! Love your work--it's always a delight. sweet work, love the wood grain! i'm tryin' to lose a few pounds as well. let me know if you find the real secret! I love it, as usual! And you would be SUCH a fabulous book illustrator!!! You could sell any book just because it had your illo's! So what's to be decided about it? It's an awesome drawing. It's great! Slightly retro feel indeed! Stunning! So much details you could get mesmerized so easily in the drawing. :) Can wait for the next one! Oh, I really really like it! 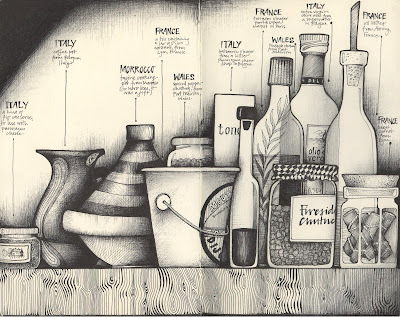 So when are you going to illustrate a cookbook? Beautiful illustration. I can understand your influence and am totally enjoying the vibe! Beautiful drawing. You work has such an apparently effortless style, very distinctive as always. Thank you, folks. I appreciate your continuous encouragement so much. Yeah, I did kind of get a bit carried away looking at the illustrations and forgot to actually start the diet. It will happen though, just as soon as I've finished all the cheese and Ben and Jerrys in my fridge (not together of course). At least, I'm not alone in having to lose a few pounds - Joseph and Suzanne. I blame it on this drawing lark, it just doesn't give you time to *cough* go running. Hi, totally in love with your illo's. Such realism and what an appreciation of detail, shadow and tone. As for putting on weight...join the club...haha. I am mesmerized by the grain of the butcher block. Unbelievable. Your work is such a treat for me. Thank you for sharing. Sometimes I can't decide whether it is the artwork, or your beautiful handwriting I love more. A great piece of wonderfulness! Hey just got back from the deepest part of Wales, I swear there were pixies in the woods!and dragons - had a wonderful weekend there. Every time I see one of your drawings I wish I had even a tiny bit of your talent. I don't suppose you fancy doing a set of tutorials, starting with tools and working through to finished sketch... With a couple of really simple objects - nothing too fancy. Nothing whatsoever to be unsure about. This is a magnificent drawing - so interesting and varied - the crosshatching, and texture. It has a whimsical feel to it to. Delightful! I didn't expect much of a response to this, but you just never can tell. Tim, I might just do that. I have in the past done some step by step stuff, so that sounds like something I could do. Cheers, guys. You really make my day. Good luck with the healthy eating, it can be a lot of work! I love the wood grain in this one. Andrea this is awesome, love love love the tagine! I love this drawing - so many details and such a nice rendition. But first of all I love your style.